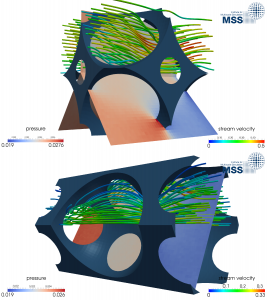 Fluid flow through complex geometric structures on the micro- and mesoscopic scales poses a very active field of research due to its relevance for many scientific and technological areas. Microfluids and microreactors are prominent examples in engineering applications where the behavior of the system is largely determined by the complicated nature of the interactions between the fluid and the boundaries of the devises. Such interactions also play a major role for the dynamics of colloids and microscopic particles agglomeration. Modeling that kind of systems is challenging not only due to the complexity of the associated geometries but also because of the multiple time and length scales often involved. To study such systems, we use different numerical simulation methods, including particle-based methods such as Molecular Dynamics (MD) and Direct Simulation Monte Carlo (DSMC), as well as continuum approaches. As many of the problems involve multiple phases, combinations of different methods are often used.